Following this thread http://reboot.pro/to...egistry-library, I have decided to use MS WDK (http://msdn.microsof...7(v=VS.85).aspx) to write a command line tool that will allow one to read and write to an offline registry hive. OfflineReg "D:\Windows\system32\config\system" ControlSet001\Control\ProductOptions getvalue "ProductType". Maybe it could be of use to add a command line parsing mechanism to the app. and same goes for HKLM, HKCU , etc. abbreviations. Since most of us have paths stored with the complete "online" path, this could be handy. CurrentControlSet has to be calculated from offline registry. echo. &echo ControlSet &#34;%ControlSet%&#34; used. Version 0.7 now also handles currentcontrolset : it will be "mapped" to the correct controlset. Example : offlinereg "C:\temp\system" currentcontrolset\Control\ProductOptions getvalue "ProductType" will actually read from controlset001 registry key. Note that since previous version, HKEY_LOCAL_MACHINE\SYSTEM\currentcontrolset\Control\ProductOptions also works fine. Does it "always" read from ControlSet001 OR it checks the value in HKEY_LOCAL_MACHINE\SYSTEM\Select ? It checks the HKEY_LOCAL_MACHINE\SYSTEM\Select key to dynamically link to the right system subkey. Sure. Just wanted to make sure you did the "right "thing. the GPO or assign a logoff script to all clients on my network. but was roadblocked when I found out I couldn't enter a QWORD value. A also can't modify the machines' GPO through WSH/WMI to my knowledge. Does anyone have a direction to point me in? OS: Windows XP Professional SP3. Last chance is to add this feature to offlinereg tool. » Low-level display of security settings with option to export it"
Edited by bilou_gateux, 04 December 2010 - 05:30 PM. Question is : could offline support qdword type? I am going to have a look at it. Based on Billou_Gateux's feedback (see previous post), offlinereg v0.8 now support 64bits qword values. Tested fine from my windows7 on an offline xp hive. Would this work from an "older" environment (like PE 1.x/XP) on a "newer" "target" (like Vista or 7)? I presume yes, since the "function" should be inside the MS .dll, right? *bilou_gateux, thanks for your useful feedback(solution). **erwan.l, thank you for your post, yes it works from a Win7 on both offline Win Vista & XP hives, also a good chance to thank you for your beautiful 100 in 1 tool [ IP Sniffer ], that's a great work. ***Wonko the Sane, it didn't work with me from vise versa environment, maybe any ready solution? Am trying to figure that out, but no luck yet. If bilou_gateux confirms this, we are back to square #1. Original problem seems to me about the impossibility to write a qword from XP (or simialr) with the "normal" tools. If this is also not possible with the nice offline library, it means that we have no means to do that from command line, and till now only Regalyzer seems like being able to do it. So, if GUI is ok for you try Regalyzer, otherwise it seems like we are missing that tool from command line. to me, it should work either way : i have already edited win7 hives from xp in the past. what i have not tested yet (but will as soon as i get it of this "thinkpoint" trojan i just got...) is handling qword values from xp. 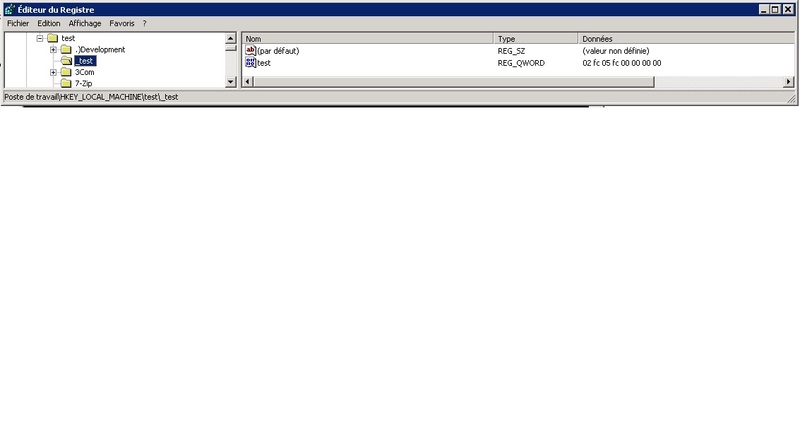 Tested fine with offlinereg from xp on a xp hive : i could add a qword entry without issue. Side note, the windows (xp) microsoft api do support qword. So we do have a command line to handle qword in windows xp and up. Then it should also work from XP to a Windows 7 Hive. jamal just posted it didn't work for him. I have not had a chance to check yet. Version 0.8 here : http://erwan.l.free..../offlinereg.zip . offlinereg.exe has generated errors and will be closed by Windows. An error log is being created. Q: Create Key feature is not yet implemented in offlinereg tool? Q: what am I doing wrong? enumkey with error 259 means "no datas available", indeed since the key does not exist. So you have to first create your key, then set your value. First off many thanks Erwan for your offline reg tool, just what I was looking for. does not. Using same software hive in both cases and without any intervening ops which might interfere. the above error whilst those without spaces do not. it was caused by having the relevant hive open in another app (Mitec's WRR tool in my case). I'll dive into this "space" issue asap. net helpmsg error_code on a command line. 32 indeed reports that the file is already in used. 3 reports path cannot be found. are you sure you ran offlinereg my_hive my_path getvalue my_value ? you need to use quote around args which contains space as this is a windows command line constraint. Erwan, many thanks for your quick reply, and my apologies for wasting your time. After your response did some experimenting and found that the problem was down to the AutoIt script I was running the command from. Although the script works perfectly for registry keys without spaces, it obviously doesn't if the key has a space in it. If I run the exact same command from a batch file it works fine. If I run the batch file from the script it works fine. Since I use AutoIt to avoid the drawbacks of batch files this is a little ironic. I run many console apps via AutoIt and find it a great programming tool, so I know this is not a general problem and don't want to put anybody off trying it. It must be down to some restriction in the AutoIt console interface that I've missed so far. Time to RTFM once more.